We interrupt our regularly scheduled Game of Thrones coverage for something completely different. I already knew the answers to those first few questions – yes, probably, and how can I forget that traumatizing experience? What I didn’t know was the answer to the fourth question. 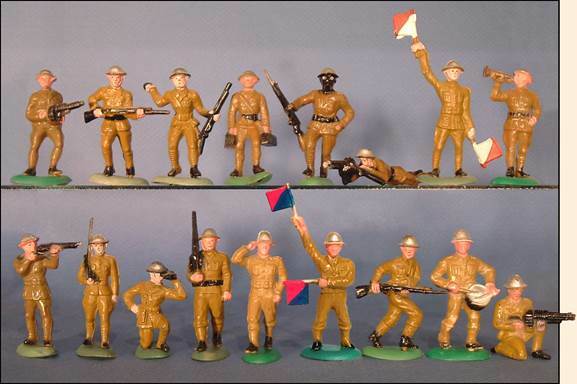 Everybody has had or at least played with those green and tan army men. They are like those little strawberry flavored candies that were everywhere when we were kids. They are a fundamental building block of the universe. I mean, they were voiced by R. Lee Ermie (the epitome of drill sergeant) in Toy Story, and spawned a video game franchise that I remember being surprisingly violent. Anyways, I was not able to go to sleep until I researched it, and what I found was moderately interesting. Because I care for you and really want you to have a deep well of useless knowledge to draw from the next time you are making small talk with family you only see on holidays, I am sharing the findings with you. You can thank me later. I also accept donations via PayPal. 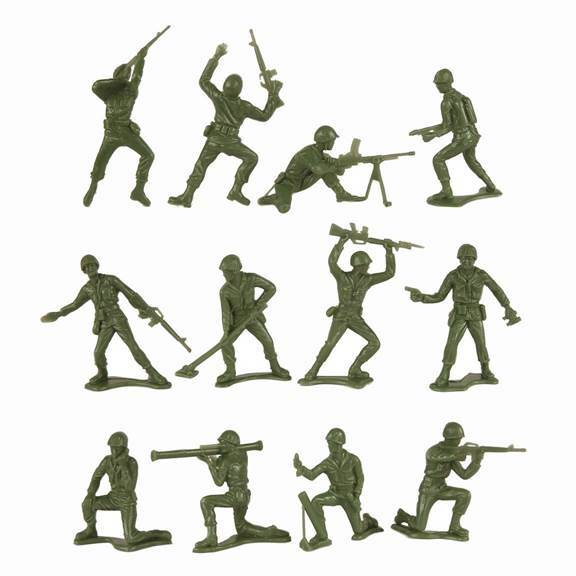 The plastic, monochromatic, military men are the successor of the Bergen Toy and Novelty Co. (Beton) line of plastic army men painted up the same as the die-cast offerings that were popular before we found out that lead is, like, hella toxic. This was in 1938, so it would still be a few years before the United States would enter WWII, so these were modeled after the United States Army’s WWI “doughboy” uniforms. Side note: die cast figures show up in The Patriot before being smelted and shaped into musket balls #themoreyouknow. The 1940’s were a trend setting decade for one of the greatest toys of all time. Not only were their uniforms updated from WWI to WWII era uniforms, but they also made the jump from painted (with lead paint) to the monochromatic look we are all familiar with. The aforementioned lead scare and a boom in the up-and-coming plastics industry lead to several companies, like Louis Marx and Company, and Multiple Plastics Corporation, springing up and offering more figures, accessories, and playsets going back to the American Revolution and Cowboys vs. Indians, to the modern space age. Unfortunately for everyone, the 1970’s kind of sucked. Sure we got some great music out of it, but we also got an oil crisis and country demoralized by the Vietnam War, which inevitably this lead to a decline in sales. 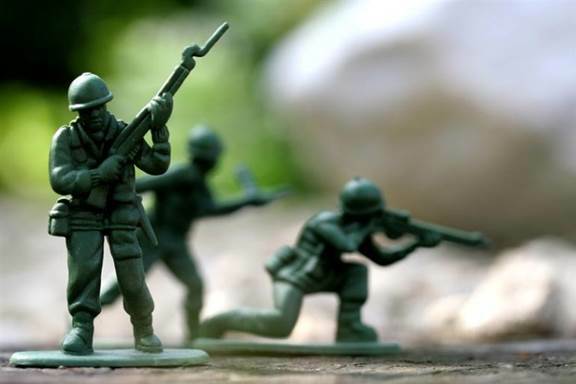 For one thing, plastics are made using oil, and when the country is embroiled in an unpopular war, people don’t want to play with toy soldiers that remind them of said war apparently. The declining popularity of the little green army man would force many of the major plastic soldier manufacturers to close their doors. Nowadays most of these figures are imitations manufactured in China, so the days of American plastic toy soldier manufactures were numbered anyway. So they next time you are walking through Dollar General and see a bag full of little, plastic army men, remember that these things were made the same year ballpoint pens made their debut and the year Seabiscuit defeated War Admiral on the racetrack.